Luis Peralta of Passaic, one of the top track and field recruits in the nation, has made his college choice. The winner is the University of Oregon! Peralta announced his choice on Instagram on Tuesday morning. Peralta had one of the greatest seasons in NJ history in the 800 last spring, capped off by a dramatic heart-pounding victory at the New Balance Nationals. 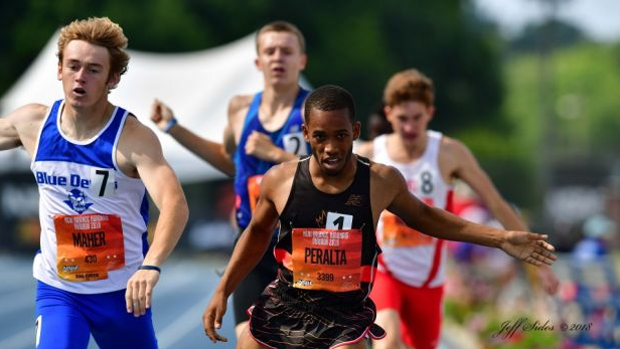 In the epic clash between NJ Meet of Champions winners at the NB Nationals last June, Peralta held off Drew Maher of Shore Regional as they both lunged for the line. Peralta stopped the clock in 1:49.10 to finish first. Maher was second in 1:49.16. Peralta's 1:49.10 is No. 5 in NJ state history and was US#2 for the season. Peralta also won the 800 at the NJ Meet of Champions last spring in 1:49.63, and captured the 800 at the Dominican Republic National Championshis in 1:50.62. Peralta, who also owns PR's of 48.75 for 400 and 4:22.90 for 1,600, has gotten off to a fast start this season. In his season debut last month at the Coach Glynn Holiday Carnival at Ocean Breeze, Peralta broke the facility record and moved up to No. 4 on NJ's all-time list in the three-lap race with a US#1 1:20.09. He also won the 1,000m in 2:35.84. In his first 800 of the season last night, Peralta ran a NJ#1/US#9 to win the Liberty Division title in 1:55.92 at the Big North Championships at Ocean Breeze. Peralta is chasing the NJ state indoor 800 record of 1:49.21 that Olympian Robby Andrews of Manalapan set in 2009 when he won the New Balance National title. The 1:49.21 by Andrews was the national high school record at the time and is now No. 2 on the all-time list. The national indoor 800 record of 1:47.67 was set by Josh Hoey of Bishop Shanahan in Pa.